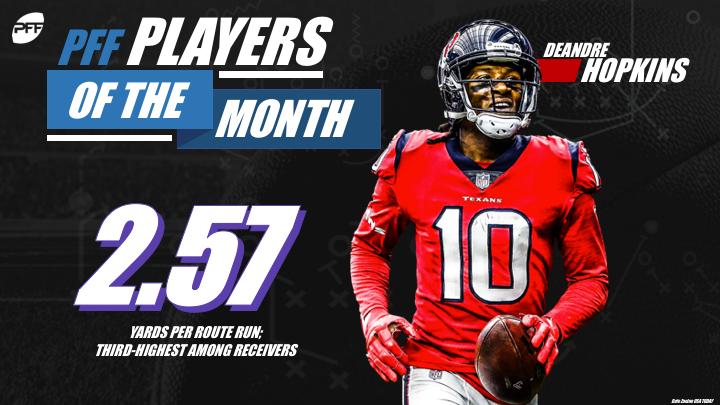 With 17 weeks of the NFL season in the books, it’s time to look at the players of the month across both conferences. The last month has produced some excellent football games and some stellar individual performances, so without further ado, here are the players of the week for the final month of 2018. The top-graded wide receiver in the NFL this season comes in as the AFC Offensive Player of the Month for December. Hopkins was excellent over the last five weeks of the season, recording a league-high PFF overall grade of 91.8 in December. Not only did he lead the league in receptions this past month with 42, but those receptions were impactful, as 31 of those receptions resulted in a first down, which was seven more receiving first downs than any other player over the last five weeks. The man who broke the single-season receiving yardage record for tight ends can add another accolade to the shelf, as his 88.3 overall grade for December sees him named as the PFF NFC Offensive Player of the Month. Kittle was an absolute menace after the catch, with a league-high 323 yards after the catch the past five weeks, 80 more than any other player at any position. Part of what makes him so dangerous after the catch is his ability to force missed tackles, and his nine missed tackles forced on receptions this month also led all players. The Texans swept the AFC offensive and defensive awards this month as Hopkins’ teammate Clowney brought home the defensive hardware with an overall grade of 91.9 in December. He was a force in both the run game –where his eight tackles for a loss or no gain led the position — and as a pass rusher where his 26 quarterback pressures ranked tied for fifth among all defenders. 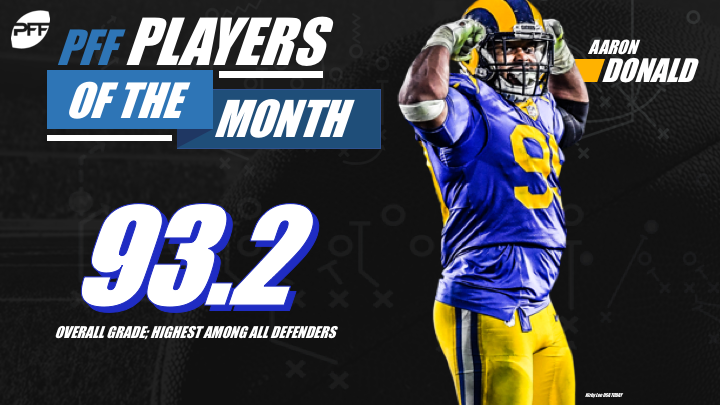 To the surprise of absolutely no one, Donald has claimed the NFC Defensive Player of the Month crown for his work the past month. His 93.2 overall grade led all defenders over the past five weeks. He continues to push the boundary as a pass rusher on the interior of the defensive line, with 29 pressures in December and 106 on the season. McClellan has been a key contributor to one of the top special teams units in the league. He played 82 special teams snaps in December across kick return, kick coverage, punt return, and punt coverage teams and received a special teams’ grade of 91.0 for the month. McClellan assisted on two tackles in special teams while missing none. Wilson played 63 snaps across kick return, kick coverage, punt return, punt coverage and field goal blocking duties for the Vikings and came away with a special teams grade of 86.9 over the past month. His five special teams tackles in the past five weeks rank tied for second-most of any player. 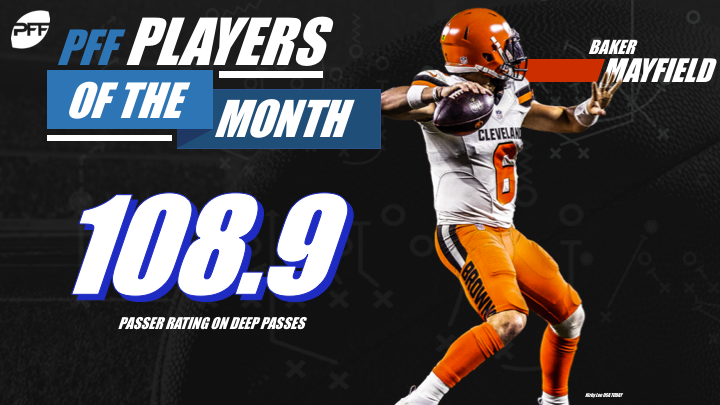 Mayfield and the Browns came up just short in their season finale in Baltimore, but the rookie quarterback gave the Cleveland faithful a glimpse of their future over the last month of the season with several strong performances. His overall grade of 83.2 across the December came on the back of a league-high 17 big-time throws. Mayfield wasn’t afraid to take shots deep downfield, and it shows in his average depth of target (10.2 yards) and his average passing yards per attempt (8.5) — which both rank among the top five quarterbacks in December. Wallace didn’t see the field at all until Week 10, but he has certainly made up for lost time with some outstanding performances across the past month. Wallace has recorded an overall grade of 83.2 since Week 13 and will look to build on that in 2019. In December, he allowed eight receptions on 14 targets across 138 coverage snaps, but only two of those went for first downs, which matches the number of incompletions that Wallace forced (two). The eight receptions against Wallace went for an average of just 7.8 yards.